But with the fame, popularity and money that Mr. West accrued, his ego and perhaps more accurately, hubris seemed to expand exponentially. There is a popular saying that states, “Money doesn’t ever change you, it just reveals who you really are.” In the last several years, Mr. West has developed into quite the verbose, unpredictable and boastful individual. Most music critics will agree that his musical abilities are still intact, but all the extra noise he creates around is turning off even some of his most loyal fans. In Kanye’s world, someone seems to be always holding him back and not allowing the world to see his full, unbridled genius. Without further ado, here are some of Kanye West’s top rich people problems. Ever since Kanye West entered the fashion industry, he made it clear that he was in love with fashion. Back in 2004, he used to call himself the Louis Vuitton don and made it a point to place his personal style front and center along with his music. But as his status and fame continued to grow, Kanye West decided that he no longer wanted to be on the sidelines, shopping for clothes that other people designed. It was time to create his own fashion brand. He threw himself into the process head first and actually debuted his first ever fashion luxury fashion show at Paris Fashion Week in 2011. The show had several celebrities and fashion big wigs in attendance including Carine Roitfield, Stefano Tonchi and Anna Wintour. The show received mixed reviews and apparently all the money that went into making the clothes and executing the runway presentation burnt quite a hole in his pocket. The show ended up being a flash in the pan. Since then, Kanye has been very vocal complaining that the gatekeepers of the fashion industry are putting a wall up and not allowing him entry into the playing field. He has repeatedly made pleas for a deep-pocketed backer to see his vision and back his creativity in the same way the Medici family fostered the art of Michel Angelo. Last year, in a series of in-depth interviews with Zane Lowe of BBC – he explained his frustration in typical Kanye fashion. Last year, Kanye released “Yeezus,” perhaps the most dense, intricate and cryptic album of his career. He released it knowing that the general masses wouldn’t quite understand his new direction, but he did it as more of an art project. After the album was released, Kanye did a series of radio interviews to talk about his new artistic direction and lament how the Corporate World and all the powers that be had hoodwinked the masses. One of the interviews was with Zane Lowe of BBC – a particularly intense session that provided all types of fodder for comedians to take shots at him and lampoon his misguided passion. Jimmy Kimmel did exactly that by having a pair of kids parody sections of the interview. Kanye obviously didn’t get the humor in it and launched a twitter assault saying amongst other things that “Sarah Silverman was much funnier than her former beau [Jimmy Kimmel]” and that Jimmy Kimmel had a “Spongebob Face.” Seems like a pretty grown-up affair doesn’t it? On the same media tour, following the Jimmy Kimmel flare-up, Kanye West visited the morning show of MTV personality Sway – a media mainstay that Mr. West knew from the very beginning of his career. The interview seemed to be going very well until Sway started to ask why Kanye has been so angry lately about not being able to make a splash in the luxury fashion industry. Sway’s point was this: “Since Kanye is a multi-millionaire, why did he need permission from these fashion gatekeepers to do anything he wanted?” Apparently this line of comments touched a nerve to which Kanye lost his cool and started yelling at high decibels – “You ain’t got the answers Sway, You ain’t got the answers.” It was such an unexpected occurrence that the outburst went viral and it fueled the collective thinking that Kanye may had possibly lost his marbles. It’s a sad reality, but the truth is if you’re a famous person in this day and age, privacy is a very tough commodity to come by. The paparazzi are hungrier and more fearless than ever before and even regular people have been known to stalk celebrities to capture pictures and videos with their cell phones and other mobile devices. Kanye West hates the paparazzi and there are several pictures videos showing him putting these intrusive camera wielders into . The most recent noteworthy encounter was actually with a random stranger who actually yelled out some disrespectful racial slurs at his soon-to-be-wife Kim Kardashian. 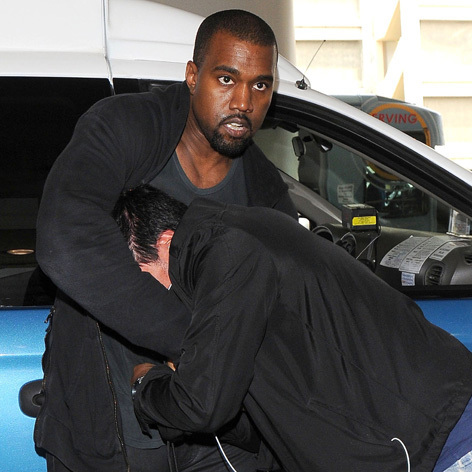 Kanye West of course lost his temper and gave this young runt a quick beat down. The result was a lawsuit leveled against the Chicago rapper which he reportedly settled out of court for a cool 250K. So to contrast what might be perceived as an overly negative tone to this article, Kanye has in fact had some memorable triumphs in the fashion industry. In 2009, he collaborated with global athletic brand Nike to release the Nike Air Yeezy sneaker. The sneaker was released in limited edition and was an instant hit. Designed by Kanye West, the Air Yeezy had a an original retail price of $275 but because of high demand and limited availability, resale prices of these sneakers soared to tens of thousands of dollars on e-commerce bidding sites like E-Bay. The success of the release compelled Nike to collaborate again with Kanye for a second edition of the sneaker in 2012. The second edition was just as successful but when it came time for Nike to release a special all-red edition of the new sneaker dubbed “The Red Octobers,” Kanye claimed that Nike employed underhanded techniques and refused to treat him like an equal at the negotiation table. This disagreement led to Kanye discontinuing his relationship and securing a deal with another global athletic brand, Adidas. We are yet to see the fruits of this new arrangement. Kanye has since apologized to Nike stating the following, "I really feel honored to have had the chance to blow Yeezy [sneakers] up with Nike - I'm not knocking them on the way out or burning no bridges. I apologize for my frustration earlier." The Red October sneakers with Nike (shown above) actually came out earlier this month and sold out within the first few hours. It seems he does have a bright future in fashion and design after all. Most celebrities and politicians know that when the clever and acerbic guys behind the animated comedy South Park decide to take aim at you, they don’t pull any punches. They have taken several shots at Kanye West over the years including a particular episode in 2009 that revolved around a political joke that one of the regular characters Jimmy wrote. In the story’s plot, everyone in the world understood the joke except Kanye West, and because he was so full of himself, he wouldn’t admit to not understanding it. The episode was an instant hit and the lampooned star offered this surprisingly lighthearted response to it: "South Park murdered me last night and it's pretty funny. It hurts my feelings but what can you expect from South Park! I actually have been working on my ego though. Having the crazy ego is played out in my life and career." Well, that was 2009, and it seems he’s still not heeding his own advice.